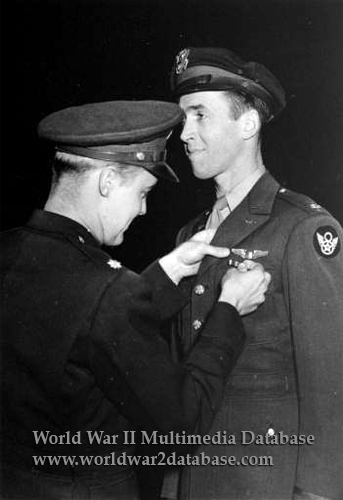 United States Army Air Force Major (later Brigadier General) James Stewart, Group Operations Officer, receives the Distinguished Flying Cross from 453rd Bombardment Group Commander Lieutenant Colonel Ramsey D. Potts for his actions on a mission over Brunswick, Germany, on February 20, 1944. The censor has deleted the background for security. "Jimmy" Stewart won the Academy Award for The Philadelphia Story on February 27, 1941. After failing two physicals for being underweight, Stewart convinced the Army to administer a third test on the spot and was inducted as a Private on March 22. Stewart was a private pilot with 400 hours flying time, and founded a flying school. By December 1941 he had passed Officer's Candidate School and was a Second Lieutenant. Nevertheless, Stewart recruited on the radio, appeared with celebrities to promote war bonds, and trained in Boeing B-17 Flying Fortresses. His applications for transfer to a combat unit were turned down, and he became a flight instructor, training many pilots and aircrew. In August 1943, he was finally appointed to the 445th Bombardment Group, which flew Consolidated B-24 Liberators. He flew an official total of twenty combat missions with that unit and rose to Squadron Commander. On January 27, 1944, Stewart was promoted to Major and assign to the 453rd Bombardment Group, where he flew more missions, but did not record them officially. He twice won the Distinguished Flying Cross and the Air Medal with three oak leaf clusters and received the Croix de Guerre from the French Air Force's Lieutenant General Henri Valin for his part in the liberation of France. While remaining operationally with the 453rd, in July 1944 Stewart became Operations Officer and then Chief of Staff of the 2nd Bombardment Wing. On April 6, 1945, he was promoted to Colonel and on May 10, became Commander of 2nd Wing. He returned home on the Queen Mary. Remaining in the Air Force Reserve, Stewart continued to fly and act in movies.